Bolivian President Juan Evo Morales Ayma arrived in the Turkish capital Ankara on Tuesday for an official visit that will include a meeting with President Recep Tayyip Erdoğan. Morales started off his visit by attending a program organized by Ankara University, joined by Education Minister Ziya Selçuk, Bolivian Foreign Minister Diego Pary, Ankara University rector Erkan Ibiş and other officials. Speaking at the event, Morales expressed his wish that the number of Bolivian students at the university would increase and that Turkish-Bolivian relations would continue to grow. Morales then went to the Presidential Complex, where he was welcomed by President Erdoğan in an official ceremony that included the playing of the Bolivian national anthem. Foreign Minister Mevlüt Çavuşoğlu, Education Minister Selçuk, Presidency Communications Director Fahrettin Altun and Presidential Spokesperson Ibrahim Kalın also attended the ceremony. Erdoğan and Morales will hold a joint news conference after a closed-door meeting and talks between the delegations. The two presidents are expected to discuss all aspects of bilateral relations, as well as regional and international developments. 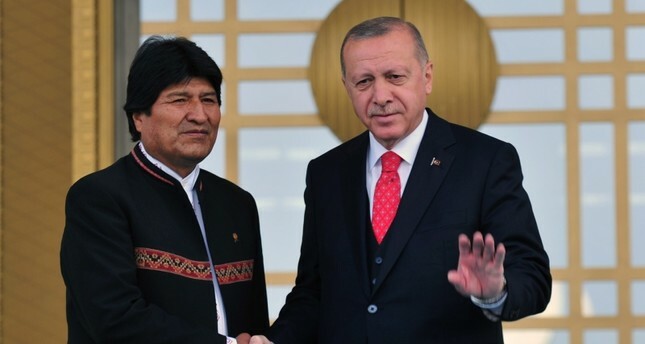 Morales, the first indigenous leader of Bolivia, is visiting Turkey on Erdoğan's invitation, the Turkish Presidential Communications Directorate said.